by Paul Peck, Buffalo Sports Page. Deonte Thompson. Logan Thomas. Taiwan Jones. Mostly anonymous, bottom of the roster players who have bounced around the NFL. Sunday, they joined Team Together, and became Buffalo heroes. 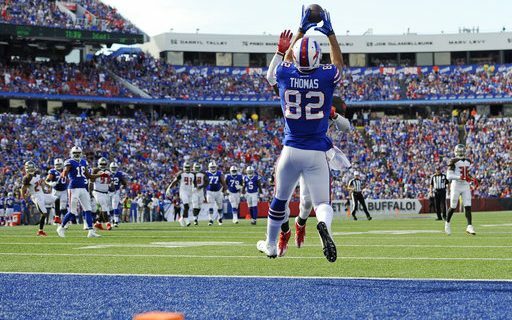 Each player provided key moments that led to the Bills 30-27 win over Tampa Bay. That those moments came from these players says exactly what this Buffalo season has been all about. The whole is bigger than the parts. Sean McDermott preaches that all the time. So far this season, it’s working. No one will tell you the Bills have an overly talented roster. So how are they 4-2? As fans and media types, we get enamored with draft picks, rankings and ratings. In many cases, the teams with the high draft picks and highly rated players do win. But sometimes, you can rally a group of castoffs, no-names and journeymen to reach new heights. A coach can motivate these players to take it out on everyone who didn’t think they were good enough. Players will always buy into this injustice, whether it’s true or not. An entire team, playing hard all the time, will win plenty of games against more talented teams that don’t always give full effort. Thompson is with his third different NFL team after recently being cut by the Bears. Signed this week, the Bills would not have won without his 4 catches and 107 yards receiving. Thomas is a former college quarterback trying to make the transition to tight end. The Bills are his 5th NFL team. The injury to Charles Clay elevated this role and he responded today with his first NFL touchdown. Jones was a no-one-paid-attention signing in August after six seasons with Oakland. All he did was turn in the play of the game, an 11 yard catch on a shovel pass that set up the winning field goal. Add in rookie Matt Milano’s key interception and Ryan Davis’ sack, and Bills fans all over WNY were grabbing their Buffalo roster. Frankly, it’s amazing that this is happening. It’s not supposed to. Stars are supposed to win in the NFL. But the Bills don’t really have any stars, other than LeSean McCoy. McDermott could wait for stars to be drafted and developed, or he could work with what he has. “I think that’s a sign of a true team, and we talk a lot about that. Who’s it going to be next week? It was DT [Deonte Thompson] this week, and Taiwan Jones, and who’s it going to be next week? Is it going to be another young guy, like a Tre’Davious [White] getting the key takeaway? Who’s it going to be? And that’s the fun part about it, is the guys come to work every Monday and every Wednesday knowing that [if] they put the time in and put the work in, that it could be them, and that’s the exciting part about it,” said McDermott. 53 players all pulling on the same rope. It’s a cliche. But it’s working. It’s the best way to describe the Bills. Team Together.